regsvr32 "C:\Program Files\Microsoft Identity Integration Server\Bin\mmswmi.dll"
mofcomp -N:root\MicrosoftIdentityIntegrationServer "C:\Program Files\Microsoft Identity Integration Server\Bin\mmswmi.mof"
Open the Component Services Console in the Administrative Tools Folder. Navigate to Console Root, Computers, My Computer, DCOM Config and then Microsoft Metadirectory Services. Right click on the application entry and select Properties. Go to the security tab and alter any security necessary. 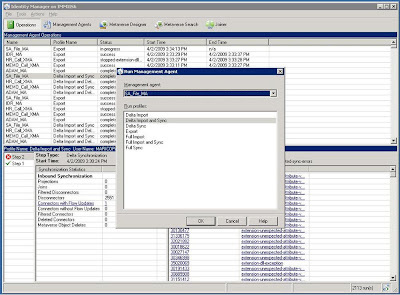 Click OK on the Application Properties page and close out the Component Services and Computer Management Consoles.